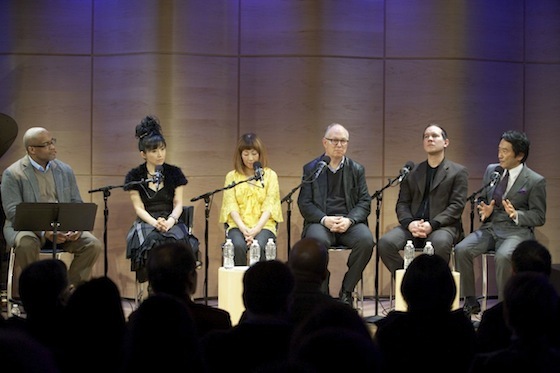 The Jerome L. Greene Performance Space on Thursday hosted The Global Salon: Cities in Japan, a thought-provoking discussion about Japan ten months after a 9.0-magnitude earthquake triggered a devastating tsunami and set off the country’s nuclear crisis. WNYC, in collaboration with PEN World Voices Festival of International Literature, presented the evening of conversation and performance. 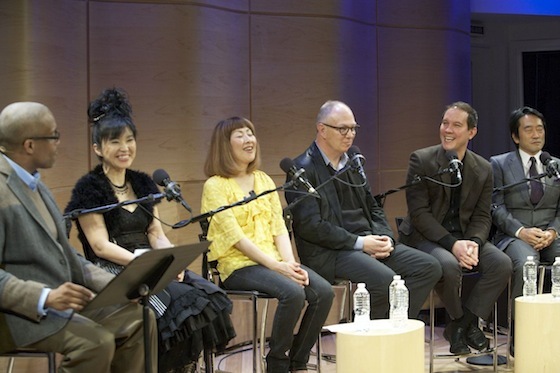 WNYC Radio on-air news host/anchor and producer Eddie Robinson moderated a panel that included contemporary jazz pianist Keiko Matsui; pop singer/pianist Akiko Yano; British-Dutch writer Ian Buruma (Inventing Japan: 1853-1964, God’s Dust: A Modern Asian Journey), who worked as a journalist covering Asia; Roland Kelts, the half-Japanese American author of Japanamerica: How Japanese Pop Culture Has Invaded the US; and Yasuhisa Kawamura, Deputy Chief of Mission for the Consulate-General of Japan in New York. Keiko Matsui kicked off the event with her performance of “Forever, Forever,” a song that brought tears to many audience members’ eyes. The panel addressed Japan’s courage and resiliency in the face of rising unemployment and suicide rates – before and after the earthquake. Kawamura delivered positive messages from Japan’s government, pointing out that Japan has always relied on the strength of its families and its sense of community. Buruma encouraged the Japanese to complain more, saying that being completely obedient toward the government isn’t always a good thing. Kelts added that protests in Japan are on the rise, including a recent demonstration that disrupted a meeting between nuclear experts and energy officials. In Kelts’s observations, March 11 is in some ways giving young Japanese a new sense of purpose. “People who never even considered volunteering are packing a bag and going up to Tohoku” to aid in the relief efforts in the hardest hit regions, says Kelts. Akiko Yano described how her Christian faith has helped her endure the hardships her native country has faced since the disaster. When Yano visited Kesennuma, a town completely leveled by the tsunami, she was shocked and touched by the strength of the residents. They told her they had nothing left, but they wanted to be the perfect hosts, asking Yano what they could do for her. “Don’t forget about these people,” Yano implored the sold-out crowd. The evening ended the way it began: With music. 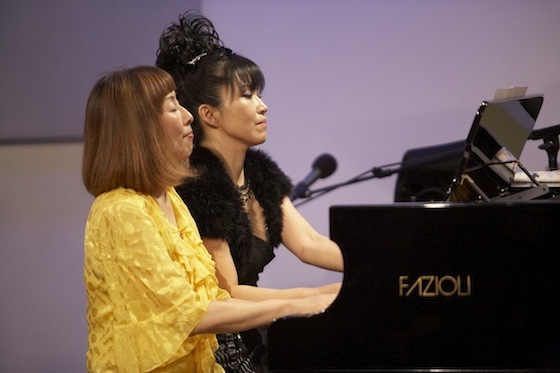 The Global Salon marked the first-ever duet for Matsui and Yano.